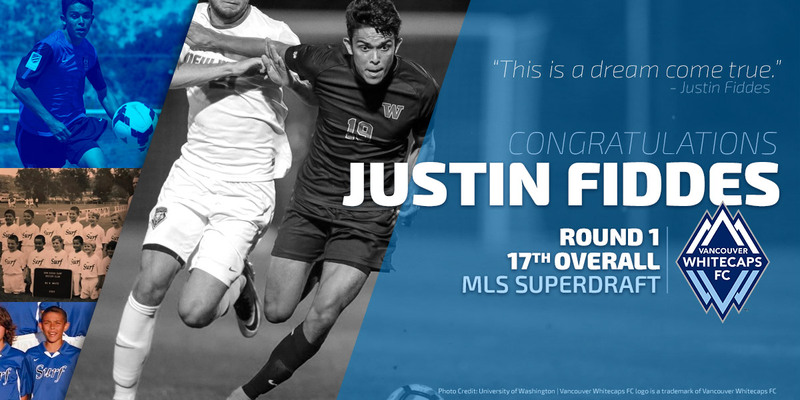 In the First Round, 17th pick, the Vancouver Whitecaps FC have scooped up San Diego’s own Justin Fiddes. Atlanta born and raised in Southern California, Fiddes’ youth soccer career started at the well known San Diego Surf Soccer Club when he was just 7 years old. A Surf SC player U8 to U18, Fiddes is thought of as a homegrown success story. Fiddes was also in the national team residency program in Bradenton in 2011. An early product of the U.S. Soccer Development Academy (DA), Fiddes played up the first year and benefited from the years of focused training. After a collegiate soccer career as a Husky, where his game continued to excel, Fiddes is now living the next stage of the player-athlete dream. A right back player who is comfortable on both sides, Born on January 3, 1996, Fiddes is a 5′ 11″ Fiddes is a versatile player who believes in hard work and wants to make an impact.